What better way to share your values with your family, your friends and co-workers than volunteering after work? Our friends at Partners Insurance are sponsoring a series of after work Volunteer Evenings! Please join us if you can! Help us build a more caring community, one share at a time. April 27, Marion COLLECTION DRIVE! 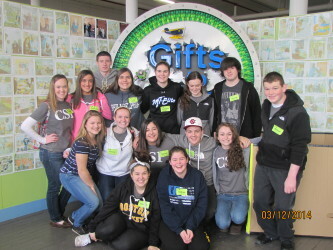 This week we met sixteen students from Cardinal Spellman High School in Brockton. We talked as a group about child poverty, the importance of education and graduating high school. We talked about giving, philanthropy, making a difference, social justice, big citizenship, the power of one, the power of a group and then we went to work. These sixteen students inspected, cleaned and processed enough great stuff to allow us to help three dozen local children in-need. How great is that? The Community Club @ Fonseca Elementary School Shines Brightly! 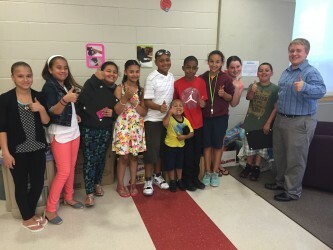 This week we visited a wonderful group of students in Fall River, at the Fonseca Elementary School. All are members of the “Community Club” an after-school program led by mentor extraordinaire, Josh Amaral. Josh invited us to visit with his social entrepreneurs and young philanthropists on their last club day of this school year. He had organized a recognition ceremony and there would be cake! Photos from our visit are here. Dominik and Konlin Turn Five – But Wait – There’s More! Turning five years-old is something very special. Especially for twins! Understanding philanthropy at five … well talk about making our day! Saturday afternoon, two ball players arrived at the mill with a zillion brand new toys in tow. They explained to us that they wanted to help children who were not as fortunate as they were and who might not get a birthday present. 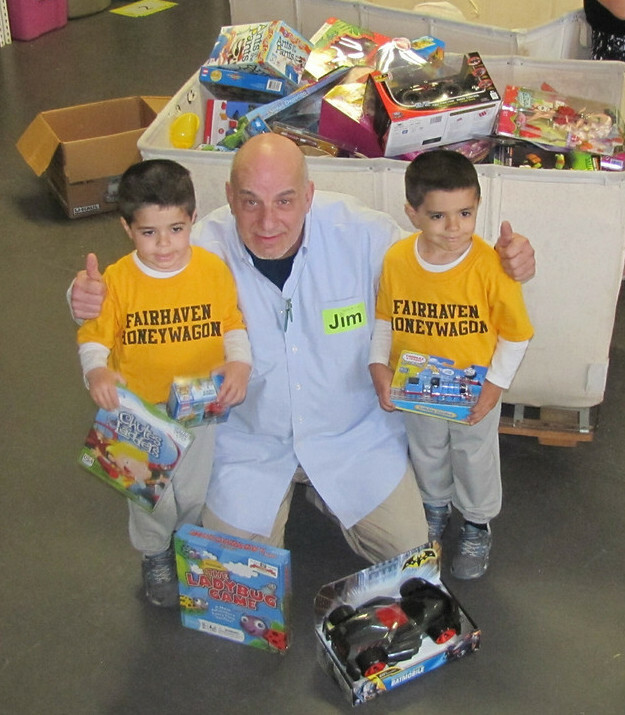 Parents Kathryn and Dennis had this to say – “It is truly our pleasure to be able to contribute. Our boy’s just turned five years old and had a wonderful party with family and friends. We have been truly blessed with two wonderful healthy boys, a loving family and many friends. We know that there are many in the community that are less fortunate than us, and we feel it is important to help others and give back whenever possible. 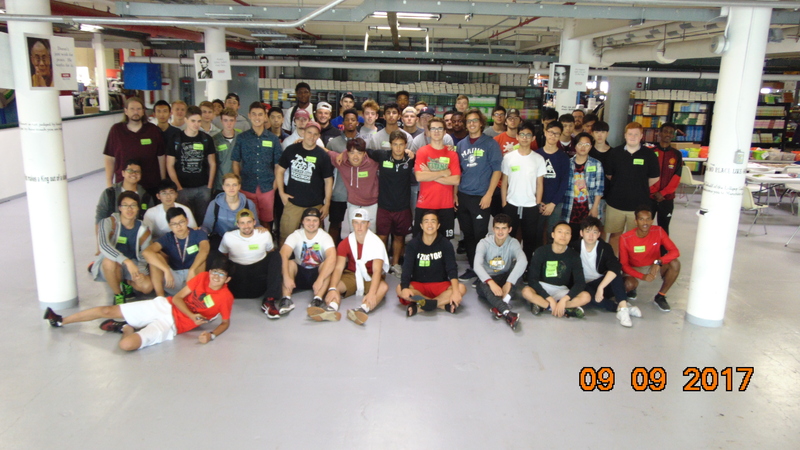 Twenty-five students and staff from City On A Hill High School spent their morning with us. We worked on gift packages, books and toys. Rather than us telling the story, we asked student Sarah Bethoney for an essay on their group experience. 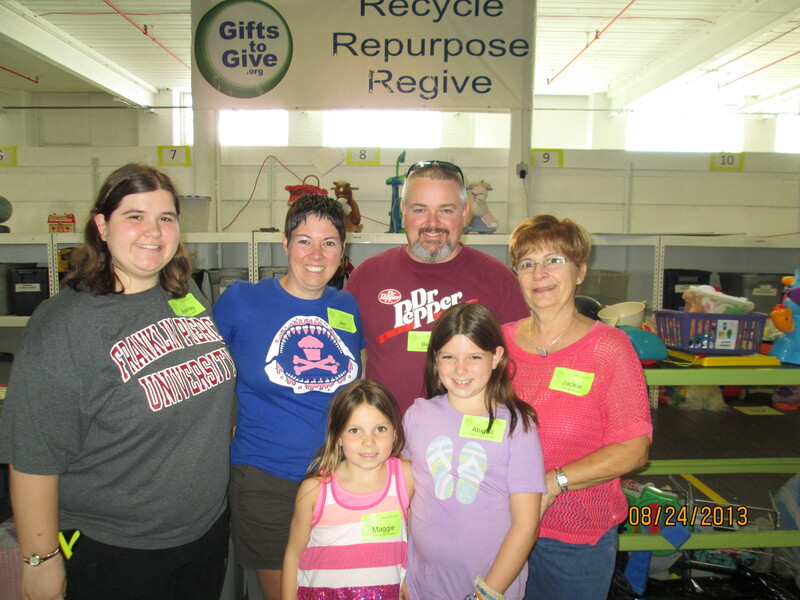 Here is what Sarah had to say: “Coming to GiftsToGive was a great experience. Learning the process of how we can help the people in our community and seeing all the work that goes into it is a phenomenal thing to see. 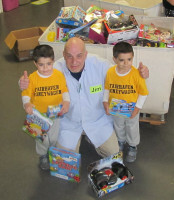 My peers and I came to GiftsToGive to volunteer by helping organize books, clothes and toys to go out to children. We could tell the story, but it is much better coming from a Mom! “Leah volunteered in December at the GiftsToGive Philanthropy Factory. While we were there, she learned that they were in need of new soccer balls, basketballs, footballs, children’s under garments and children’s toothbrushes. When Leah heard this she knew she wanted to help. It hit close to her heart since her family is very involved in sports. Sports equipment is all over her house, she wanted every kid to be able to have a ball. Never ever, under-estimate the power of Brownies! 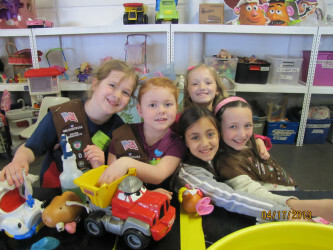 During their community service visit, Brownie Troop 80172 was upset when they heard how about how many local kids did not have basic essentials! They made a plan to raise money and purchase new items. Brownies from Freetown and Lakeville raised enough money to purchase new socks, underwear and art supplies to help over 123 local kids in-need. How absolutely amazing is this? When people talk to us about the problem with kids today, we smile, shake our heads and tell them about the 80172 Troopers. Talk about bright and shining lights! Abby shares her birthday – again! Nine year-old Abby is in the 4th grade and lives over an hour away from New Bedford. For the second year in a row, Abby asked friends coming to her birthday party not to bring her any gifts. 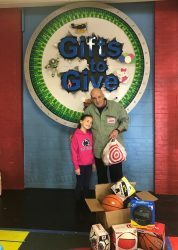 Instead, she wanted them to bring new things that she could donate to GiftsToGive. Abby likes to bring everything down to the mill with her sister, Maggie. Maggie is in the 2nd grade and just turned seven. “This was the response of a student to a seemingly simple question: “What is Worcester Academy all about?” The question, posed by GiftsToGive founder Jim Stevens, hung over the fifty Worcester Academy students for several heartbeats before it was answered. 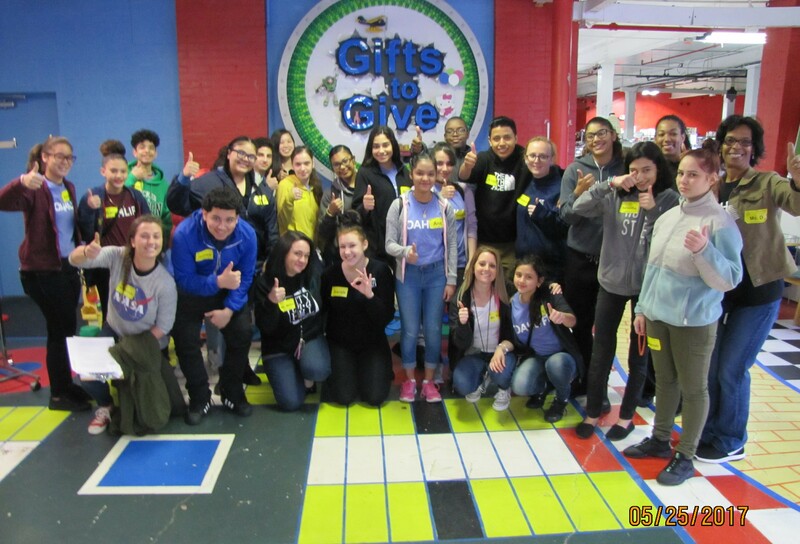 We had traveled that Saturday morning from Worcester to Acushnet to fulfill a community service obligation, a school-mandated requirement that is part of every student’s experience. The fifty boys, all upper classmen, were dorm mates; they boarded the bus that morning without complaint, napped or talked or joked around for the hour it took to get to Acushnet, and then assembled in the bare-bones repurposed warehouse that served as the factory’s base of operations. GiftsToGive Volunteer Jillian Zucco is crowned Miss Massachusetts! Jillian is truly a bright and shining light and for us a most perfect example of giving and service. 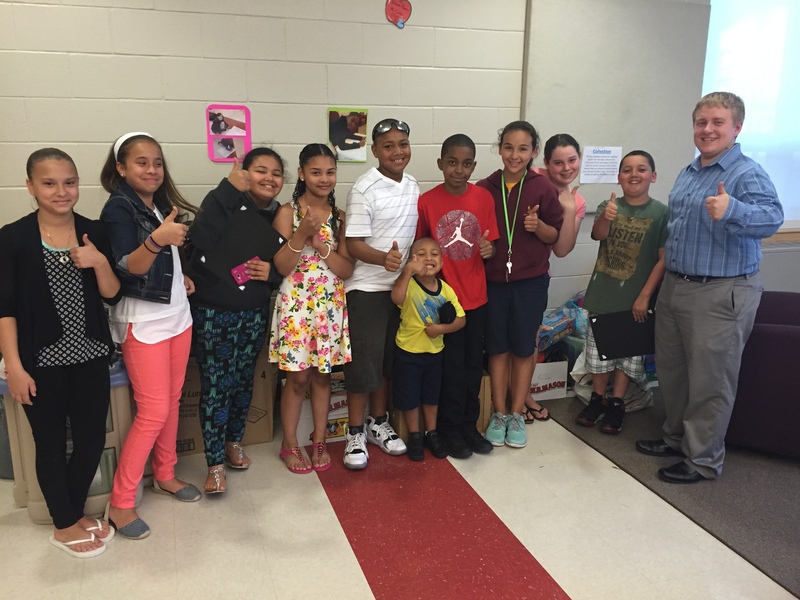 DeMello Elementary School – Student Council – A Force for Good! 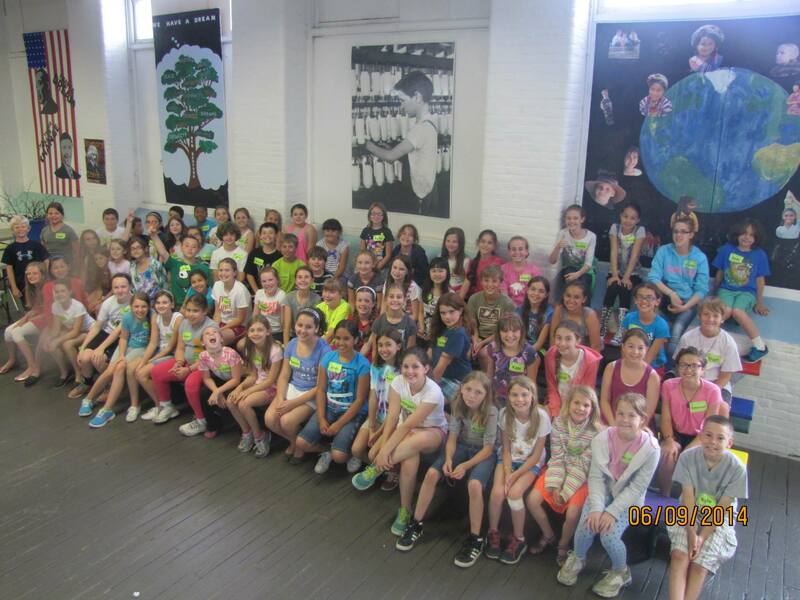 On Monday, 70 members of Dartmouth’s Joseph DeMello School’s Student Council performed an afternoon of service.. 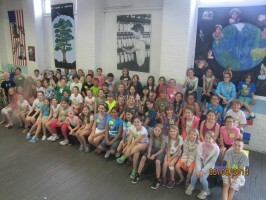 The group of 4th and 5th graders, who have held donation drives to benefit some of the 35,000 local children living in poverty, volunteered their time inspecting, sorting and processing a zillion pounds of donated clothing and toys. 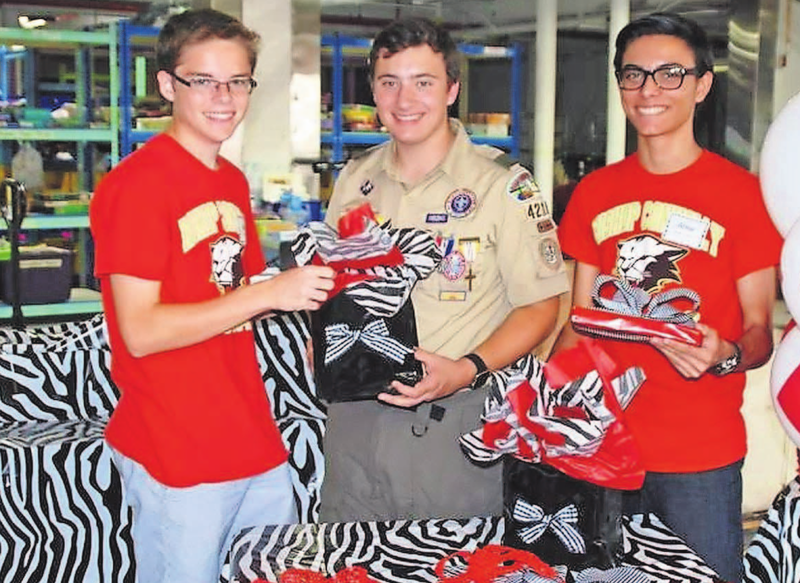 They also experienced the power of giving and service in the most tangible ways! Photos from our day are here. When people talk to us about what is wrong with kids today; we smile and listen politely, then reply with a recent story about Matthew, Jonathan and Arthur. 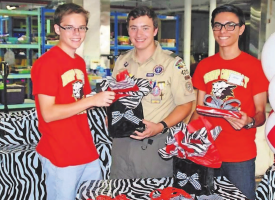 Read the local paper’s story here. 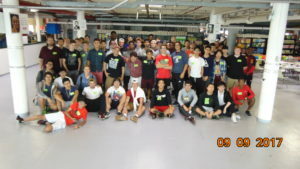 Johnathan who is a sophomore at Bishop Connolly High School has been volunteering with us since he was in the 7th grade. 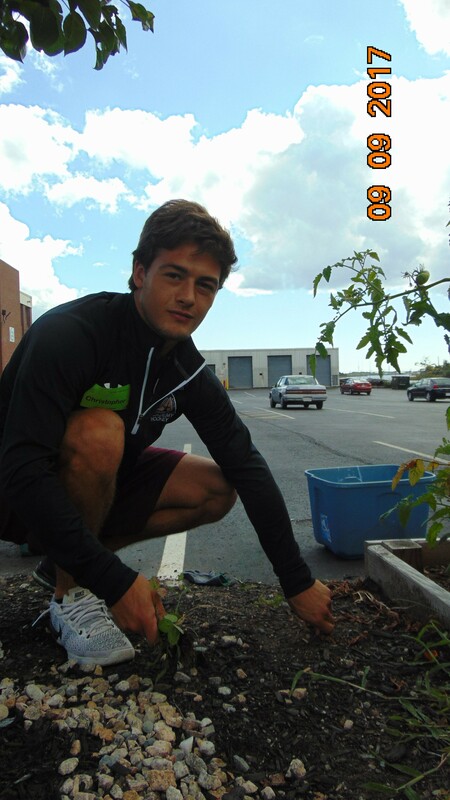 Jonathan has set a record for helping Newport County Rhode Island families and is now recruiting fellow students to do the same. A Real Life Science Experiment: The Ripple Effect! Michaelah Noelle Nunes is an amazing young women! 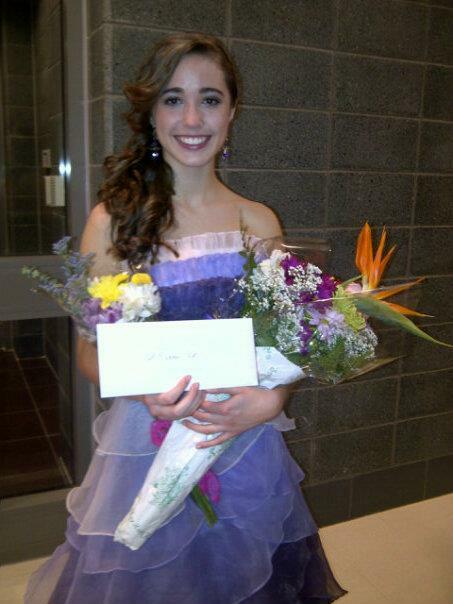 Michaelah has competed for 4 years in the Miss New Bedford’s Outstanding Teen pageant. 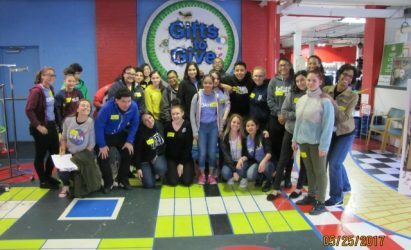 This is her second consecutive year hosting a community drive to benefit GiftsToGive as part of her chosen platform, titled A Real Life Science Experiment: The Ripple Effect. Michaelah intends to show others how even the smallest form of contribution, much like a drop in a small pond, can have a ripple effect, reaching far and wide. A story about tempered glass, but not really!